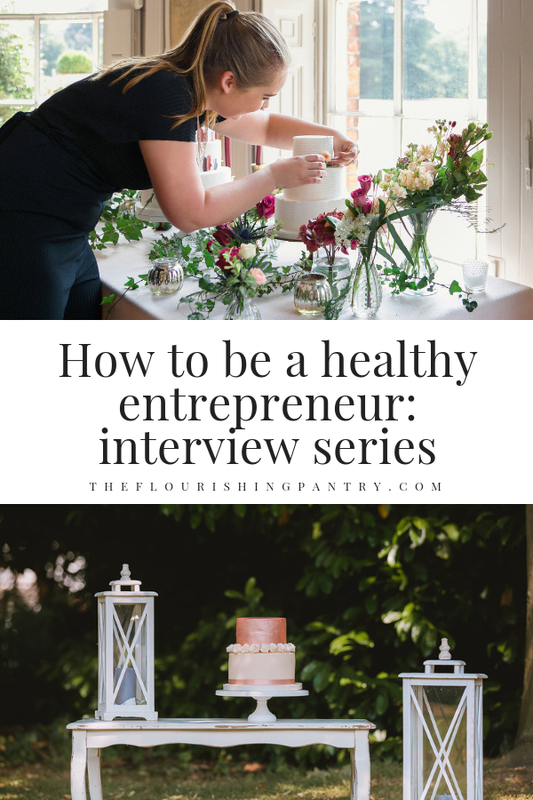 It’s time for another Flourishing Entrepreneurs interview! Today I’m introducing Flourishing Entrepreneur #7 Ella Hulbert of Ella Rose Cakes, who just happens to be my sister. She’s featured on the blog in the past with her cake recipes so I’m excited to introduce you to her properly this time with a full dig in to her career and entrepreneurial journey. Ella – baker, business woman, wife, sister, daughter, friend, and mother of cats. Ella Rose Cakes – bespoke cake designer based in Surrey. The ‘advice’ (and I use the term very loosely) from my careers advisor at school was pretty poor, although I had a fantastic business studies teacher who believed in me and told me I was good enough to go to university (and thank goodness I listened! But, with both parents in the arts they weren’t even aware what ‘business studies’ actually was, let alone why I did it at GCSE, A-Level and then a Business Management degree. I think my mum had hoped I’d be a beautician locally, whilst I originally wanted to be a stage makeup artist (or a pop star, obviously), and then I wanted to own a salon. At university I worked in events management for a caterer but since graduating I’ve been in technology doing account management, communications and PR roles. Writing it down and reading this back, I’m not sure how I ended up in technology so far from everything I’d dreamed about doing and had a passion for when I was younger, but it makes sense as to why I’m trying to bake my way free now! My A-Level coursework in Business Studies was to write a business plan (for a beauty salon), so my mind set got quite clear quite early; I knew I’d like to ‘run the show’. Through university and for some time after, I thought I could do that by being high up the corporate ladder, but now, health and happiness are my real drivers and where my mind set sits today. I think whatever you do in life (including work) it should always be with your health and happiness in mind. Is it making (or keeping) you healthy? Is it making you happy? Once I realised these were big priorities for me I knew I’d feel much better about my life and career if I owned my own business. I’ve seen a lot of redundancies in my corporate job over the past decade and thankfully managed to avoid them all, but witnessing them each time makes me re-evaluate the dependability I have had on a big corporation to employ me and how disposable I can feel in a large workforce. I’ve been striving now for more security and control over my own destiny, a feeling I’m only going to get from owning my own business. I’d never change the career path I’ve been down, I’ve learned so much about businesses, managing people, budgets, marketing, events, catering and so much more that has prepared me for having a business of my own. In a world of cake it’s very easy to not be that healthy – my living is literally made from sugar! I know for me, my weight increases if I’m not going to the gym regularly and trying to eat healthily, but with two jobs at the moment the only time I find to fit the gym in is at 6am. Thankfully I’m a morning person and my local gym (I go to Like2Lift) has a great community spirit in a 6am class of weights and strength training which I really enjoy. I know that when I fit the gym in before 7am I’m going to have a productive day so it’s a great way to start. Whilst this works for me on the whole, it also means I get tired in the evenings and end up in bed super early, so I give myself a few weeks out now and again to rest my body and recharge my energy levels. I replace my morning gym with evening yoga (I go to Very Yoga in Reigate) and meditations using HeadSpace or Calm. I’d love to feel like I have more time to meal plan and prep healthier meals as I truly believe healthy bodies are made in the kitchen as much as they are in the gym. But sometimes it’s hard to find healthy meals that are quick to cook as well as being tasty enough that my husband will eat too. Some days we’re lucky if I’ve cooked anything at all, let alone something healthy! I’ve always been told you can’t say you don’t like something unless you’ve tried it. And I’ve always been told to clean your plate – I hate waste, but that also means I probably eat a lot more than I should just so it’s not ‘wasted’. I’m trying hard to stop eating when I’m full and not just when it’s gone. I am definitely someone who lives to eat. I love being in my kitchen, it’s my happy place, but that’s mainly when I’m baking and when I’ve got the time to dedicate to it. I challenged myself to trying 100 new recipes one year which was amazing and pushed me to experiment a lot, but now I’ve started Ella Rose Cakes as a side hustle, I don’t have the same time to commit to kitchen creativity for my own consumption. I’m looking forward to the day when I’m doing just my cake business and will do less job/job juggling and more life/job juggling which will definitely include more time for making good food. It’s not a meal per say, but mince beef is my favourite food by a country mile! It’s so versatile too: lasagne, bolognese, meatballs, shepherd’s pie, kebabs, burritos, burgers... I’ve been known to just fry mince and eat it straight out the pan on nights when I’m alone and wanting to treat myself (but also be a bit lazy). I’m terrible at comparison-itis and it’s something I work on daily because it definitely makes that voice louder. I’m a rational person though so I know, even when I think the negative phrase, that it isn’t true. I’m learning to trigger a reflex to recall the evidence that proves the voice wrong. I look at testimonials, or photos of cakes I’m proud of, and I remind myself my journey and pace are right for me. Then I ask my sister if I’m good enough and she always tells me I am. Alternatively, I pour a glass of prosecco and find something positive about me to ‘cheers’ to – it’s amazing what a toast and some bubbles can do to a negative voice. Self-care for me is ‘guilt-free time for yourself’. Guilt free is about knowing I am worth the time and deserve it. I struggle a lot with unnecessary guilt so I know it’s easier said than done. But, if I’ve worked hard and been productive it can feel like I’ve earned it, or if my body is giving me warning signs (like being tired or ill), then I know I need it. When I fit the gym in early, I count it as ‘me-time’, and when it comes to the other end of the day I try and make sure I’ve got relaxing music on in the bedroom, I spray relaxing room spray or put lavender oil on my pillows and I’m trying to put my phone down time enough before my light goes out to actually pick up a book and properly unwind. I’m lucky I’m a good sleeper for the most part, but I’m also aware that my body needs as close to 8 hours as possible. If I’m asleep by 10, I can easily get up for 6. If I can’t make it the gym or a yoga class I have to make a conscious effort to not feel guilty when spending a short time for self-care each day, even if it’s just taking a cup of peppermint tea and drinking it ‘screen-free’ outside for 10minutes. I’ve never been a big reader so it takes something special for me to read more than the first few pages of any book, but ‘The Girl Code: Unlocking the Secrets to Success, Sanity and Happiness for the Female Entrepreneur’ by Cara Alwill Leyba is incredible. I felt like every page was written specifically for me. I’ve already bought copies and given them as gifts because I think everyone should read it. Find your Tribe AND your Cheerleaders. And know the difference. Your Tribe is a group of people on the same or a similar journey, these are the folks who will ensure you don’t feel alone, they will reassure you but also share and help you overcome, progress and achieve. Your Cheerleaders on the other hand, are your biggest fans, people who think you are amazing all the time. They might not know the ins and outs of your business, or even understand your industry or why you are doing what you’re doing, but they support you 100% and are genuinely happy for your success, every time. When you need a pick me up they are your people.